StashAway’s investment framework was built by a team of seasoned professionals who have managed significant assets for sophisticated institutional investors. 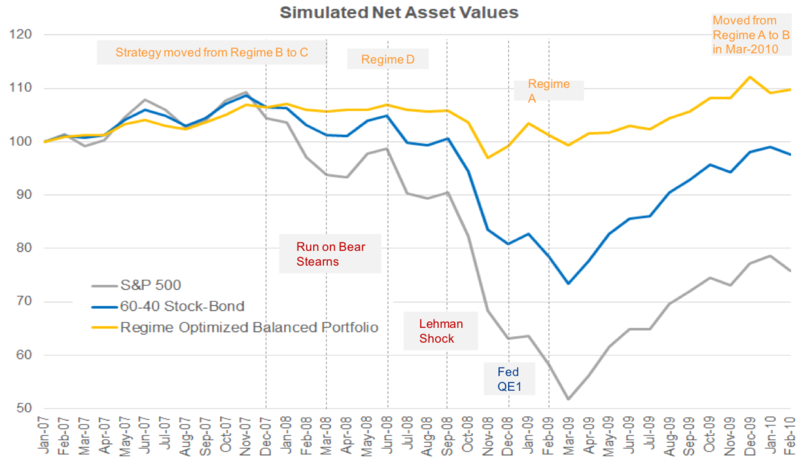 Knowing that economic data can indicate when the economic environment changes to the point where the relationships between asset classes materially change, and that economic data are ultimately what drive medium-term performance of each asset class, the team built an investment framework that relies on using economic data to assess and update any given portfolio’s asset allocation. The economic data indicate which economic environment, or what we call a regime, we are in. Our system reads the data to determine what regime we are experiencing, and then maximises long-term wealth creation through intelligent, systematic asset allocation for every single portfolio. In other words, your portfolio will have a different mix of assets and types of assets in a recession than it would have in good times (perhaps more gold in a recession than you would in good times, and more equities in good times than you would have in a recession) in order to maintain your risk level as economic environments inherently change. How does identifying a regime change and then acting on it actually matter? The 2008 Global Financial Crisis persuasively proves that StashAway’s Economic Regime-based Asset Allocation (ERAA®) can protect capital effectively through tough times, such as a recession. Protecting capital in bear markets is important, and investors often lose sight of this when they get complacent after years of positive results from equity markets. It is important because recovering from large losses is very hard and takes a lot of time: a 50% loss requires a 100% gain to be recovered fully! So what happened in 2008, and how would have been possible to prepare portfolios for the unexpected events following Lehman’s bankruptcy? The day before Lehman Brothers filed for bankruptcy on September 15, 2008, the S&P 500 closed at 1,251; 6 months later, on March 9, 2009 the S&P 500 closed at 676. In the span of those 6 months, the US equity markets lost 46% of their value. Investors with excessive exposure to this asset class, would have lost a very significant amount of capital and would have needed to make almost 100% in returns to make up for the loss. While the 2008 crash, as every other market crash, would have been impossible to predict in terms of exact timing and size, investors looking at economic data would have been able to build portfolios better suited to navigate those rough markets ahead of time. By June 2008, economic data received for the month of May 2008 (one-month delay) would have already confirmed that the US economy was in “stagflation”. This means an economic environment with negative growth and high inflation. With US industrial production going negative 3 months before Lehman’s bankruptcy, investors did in fact have ample time to react to the new economic situation, and re-optimise their portfolios before the market crash. In June 2008, ERAA® would have adjusted portfolios to have limited equity exposure, and with exposure limited to sectors such as consumer staples, and to have stronger gold and fixed income exposure, particularly long-dated. The chart below shows how StashAway’s ERAA® would have changed its portfolios before and during the crisis, and how this would have affected a balanced portfolio returns versus the SP500 and versus a traditional 60-40 portfolio. As these were unprecedented volatile times, there were numerous regime changes in a short period of time (3 changes in 14 months). In the 3 years around the 2008 financial crisis, the ERAA®-optimised balanced portfolio would have made 11.4% in returns, while the S&P 500 lost 23.2% and the 60-40 stock-bond portfolio lost 1.4%. The benchmark is composed of 60% in stocks (as measured by Vanguard Total Stock Market Index, VTSMX) and 40% in bonds (as measured by Vanguard Total Bond Market Index, VTBMX). ERAA® was built to protect StashAway’s investors money during the ups and downs of the market. This article focused on on “Pillar I (Economic Regime)” of the framework. You can find more details on ERAA® in this white paper.